I started in the construction field when I was 19 years old working with my friend’s paving company. Then from here my experience in the industry quickly grew as I made connections with contractors who specialized in different fields. So, I ultimately landed me on a year long job helping turn a sink-hole ridden piece of land on the side of a cliff into a multi-million dollar custom home. I have personally performed many aspects of both residential and commercial construction. Most recently, I was traveling all over the east coast doing many different types of carpentry. However, I specialized in installing cabinets and Corian countertops. I took great pride in seeing my finished product put a smile on my customers’ faces. However, after laying roofs, framing rooms, hanging siding, and installing bathrooms and kitchens I am excited to be on the planning side of the business. I consider myself lucky to be a part of Monk’s Home Improvement, a company with a reputation for making customer satisfaction its number one priority. I look forward to being the solution to your home improvement needs. 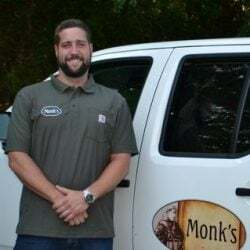 Dave manages all home improvement projects for Monk’s located in Berkeley Heights, Gillette, Stirling, Millington, Warren, Watchung and Bridgewater. To schedule a free estimate with Dave Cleaves, please call the office at 973-635-7900. Estimate appointments are Tuesday – Saturday. Make an appointment with a Designer in our Showroom. While you are welcome to pop in, an appointment guarantees you undivided attention for an hour and a half. You can shop for Cabinetry, Countertops, Tile, Flooring, Hardware, Vanities, Windows & Doors.